There’s a lot to like in Mary Ann in Autumn, Armistead Maupin’s eighth novel in the ‘Tales of the City’ series. Mary Ann in Autumn is a good read and Maupin truly is a master storyteller. 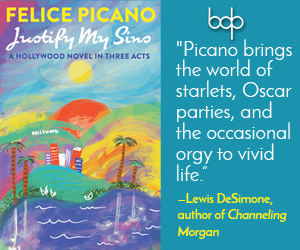 Readers can count on him to entertain, even as his characters struggle against sometimes horrible, and at times highly melodramatic, circumstances, as is the case with the other novels in this series. Maupin always goes for the laugh–and overwhelmingly succeeds–fortunately another constant. Maupin’s satirical edge is changed from when he began his serialized tales as a closeted reporter for The Pacific Sun more than 35 years ago: ridicule has grown into a knowing mix of humor and understanding. What remains unchanged are Maupin’s deeper commitments–to the chosen family, to community, to tolerance, to acceptance–all carried forward from the original ‘Tales of the City’ in good stead, reminding us that good writing has something to say and is not solely a performance to be enjoyed and then forgotten. Maupin brings back seven of the original ‘Tales of the City’ survivors, chief among them Mary Ann Singleton, the woman who started it all (even before the ‘Tales of the City’ novels, when Maupin created her for a 1974 weekly in an article about a pick up scene at a San Francisco grocery store). 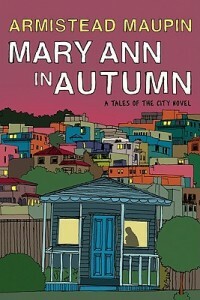 Maupin takes a big risk in centering this comic novel around Mary Ann, who returns to San Francisco decades after moving east, now a sometimes unlikeable, neglectful, self-centered and unsympathetic victim of sorts, prone to dumping on Michael “Mouse” Tolliver, the longtime friend to whom she unburdens herself. Happily, Maupin’s quick-cut chapters and wildly disparate characters easily make up for Mary Ann’s weighty problems and deflated, “horribilizing” attitude – which so clearly go against Maupin’s wittier impulses. As Mary Ann reveals and lives through her several crises, Michael and his significantly younger life partner Ben, along with Michael’s business partner Jake, form a humorous, nurturing, and also challenging circle around her. 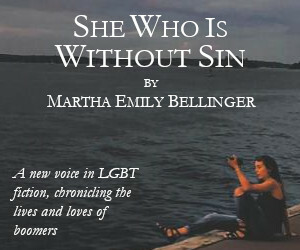 Shawna, Mary Ann’s abandoned daughter, and her lover Otto set another example of vital coupledom, the antithesis to Mary Ann’s “Singleton” status. Anna Madrigal, the guiding spirit of the entire series, who lives with Jake and with him constitutes another couple, remains a welcome if greatly reduced presence in this novel. With these partnerships, Mary Ann in Autumn firmly focuses on pairings and marriages and their slower rhythms and narrower, more personal concerns. One obvious dilemma deserves mention: it is impossible to discuss this novel without including its predecessors. Since a good number of Maupin’s readers are likewise already steeped in the series, the novel’s recurring explanations of what has come before are often a drawback, as Maupin, writing for both longtime readers as well as newcomers, sometimes bogs down the action. Still, the brio that defined ‘Tales of the City’ remains. Maupin really throws himself into his story, and his embrace of current concerns and up-to-the-minute jargon are enjoyable, though some throwaway cultural signposts like the names of TV shows and repeated mentions of brand names to identify various objects seem distractingly like filler. Still, as with the best writing, wholly ordinary words come ringing through, not sticking out from the narrative but underscoring it; yet, one word largely absent from this book that stood out in the original ‘Tales’ is the word “magic.” I miss this indispensable reminder of what made Maupin’s singular fictional world so extraordinary. Another wish is that Maupin had explored further some of his more complex themes such as open marriages or the intricacies of pre- and post-op transexuality. Armistead Maupin’s mastery continues to blaze through his latest ‘Tales of the City’ novel. Maupin’s groundbreaking and wildly popular ‘Tales’ raised the bar to a height that would be hard for anyone, perhaps even Maupin himself, to match. Here’s hoping that the publication of Mary Ann in Autumn does more than serve as a tie-in to the launch of the musical based on the ‘Tales of the City’ series set for a 2011 opening in San Francisco. David Blaustein is a writer and artist living in Brooklyn, NY.